Daniel’s Farm and Greenhouses is buzzing in the springtime! Come by for a colorful and refreshing taste of Spring! Visit our warm greenhouses on a cool spring day. All our greenhouses have cover from the spring rains! Over 15 Greenhouses! Our selection is overwhelming and our colorful greenhouses are breathtaking. 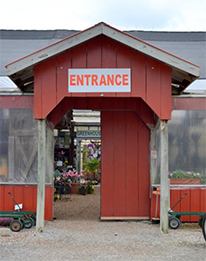 With over 15 greenhouses full of variety and quality plants, you’re bound to find something for your gardening needs! Although before Mother’s Day it’s too early to plant tender greenhouse plants outside, it’s not too early to plan. Mother’s Day! Instead of spending money on flowers that will only last a week, buy mom a gift that lasts. We have plants and flowers that will offer lasting color all season long! Landscape Idea Service! So you want to re-landscape an area yourself but you need some ideas and guidance? Click on our service link for more information about this free service. Landscape Design! If you are looking for more than suggestions and wish to hire out the hard labor, have us design and landscape your area! We offer full service design and landscaping! Call for pricing and to set up an appointment! Flowering Trees and Shrubs! Spring is the time of year we have our biggest selection of trees and shrubs. Visit Daniel’s to purchase beautiful spring blooming trees and shrubs, from Cherry trees to azaleas. You’ll know exactly what you are getting when you purchase them in bloom. Click on our tree and shrub link for varieties and prices. Perennials, Annuals, Roses, Vegetables, Hanging Baskets, Tropicals and more! Whatever you need for your garden, patio, or landscape Daniel’s has it! Reliable perennials that are hardy for our zone, given the proper care, colorful annuals, beautiful roses, a huge selection of vegetable and fruit plants, thousands of hanging baskets to choose from and unique tropicals. Lawn Care Supplies! We have premium grass seed varieties, blended to thrive in our Missouri climate. We also have all the fertilizers and weed control products you will need to have the best lawn on the block!